Large dams on the Mekong River in China’s Yunnan province have considerable impacts on downstream river flows. This is shown by new research by myself and colleagues at Aalto University in Finland, and published recently in the Journal of Hydrology. The Mekong originates in China where it is known as the Lancang, before flowing through Thailand, Laos, Cambodia and Vietnam. China has built a cascade of six hydropower dam projects on the upper reaches of the Mekong River. The first project, known as Manwan, (1,670MW), became operational in 1993 and the latest, known as Nuozhadu (5,850MW), began operations in 2014. The cascade has the capacity to produce 15,000MW of power and store over 23 cubic kilometres of water, 28% of the annual river flow at the border of China and Thailand. Downstream countries are also exploiting their hydropower resources, with Laos recently announcing it will start construction of a third contentious dam on the Mekong. We found that major changes to the river flow began in 2011 and were the largest in 2014. Hydropower operations caused exceptionally high dry season flows and low wet season flows in northern Thailand. In 2014, the dry season flows reached record highs of two to three times the long-term average. During the same year, wet season flows reached record low levels and were roughly two thirds of the long term average. These changes in flow were observed over 2,000 kilometres downstream in Cambodia, where the dry season flows increased by half. In 2012, we used simulation models to predict how the hydropower cascade would change river flow, and in fact our predictions closely matched the observed fluctuations in flow. Thus we have a fairly good understanding of the changes that are taking place. It is now clear that the construction of large dams on the upper reaches of the Mekong have resulted in widely fluctuating river flows, depending on the hydropower operations. Changes in river flow play an important role in the ecology and economy of the Mekong River, which is rich in biodiversity and the source of livelihoods and food security for millions of people. 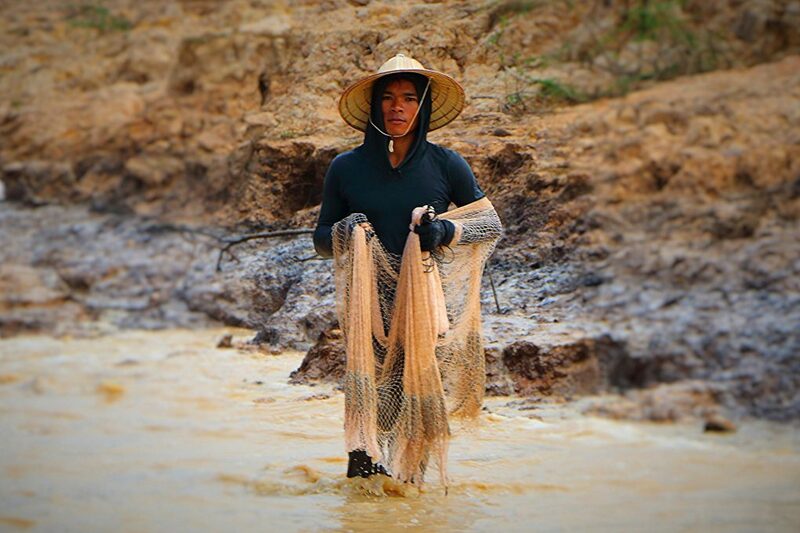 Fishing is particularly important to people as the Mekong River is one of the world’s most productive inland fisheries, with an annual catch of 2.6 million tonnes. The annual value of the river’s fisheries is estimated to be US$4-7 billion (28-48 billion yuan). Over 1,000 fish species have been found in the Mekong, including giant sting ray, freshwater dolphin and giant catfish. 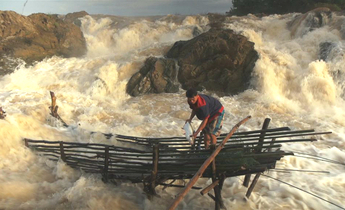 A key driver of the biodiversity and productivity of the Mekong River is the river flow regime driven by monsoon rains, often called the annual flood pulse. This transports large amounts of sediment and nutrients along the river and has created diverse floodplain habitats. As the river flow changes, we have observed an increased variability of this flow regime and a smaller annual pulse. In addition, the dams block nutrient-rich sediment that would otherwise be carried downstream. Our research predicts that these changes are likely to lead to lowered ecosystem productivity, which may have significant impacts on the ecosystems and communities that depend on the Mekong. Reports by Chinese scientists have already shown the negative effects of dams on the ecology along the Chinese part of the Mekong River and a reduction in the number of fish species during the construction period of the six dam cascade. The effects on the ecology and people in the downstream countries since the completion of the dams are yet to be scientifically documented and published. The increase in dry season river flows may, however, benefit certain sectors in downstream countries. Increased water availability during the dry season may improve irrigation and navigation opportunities on the mainstream of the Mekong. The benefits would be greatest during drought periods. For example, during the dry season in 2016, China released water from the reservoirs to alleviate downstream drought. However, to make use of the increased dry season water availability, river flow needs to be predictable. Our research shows that hydropower operations result in large and rapid fluctuations in the dry season river flows year on year. The lower Mekong countries (Cambodia, Lao PDR, Thailand and Vietnam) are also heavily involved in hydropower development. Their economies are growing rapidly, and so is their demand for energy. These four countries have built over 40 large dams in the Mekong River Basin and plan to construct another 80. Lao is one of the largest hydropower developers in the region, and has recently begun construction of two dams in the Mekong mainstream: Xayabury (1,260MW) and Don Sahong (260MW) and has announced it will proceed with a third mainstream dam: Pak Beng (912MW). The mainstream dams in the lower Mekong Basin are a concern due to their potentially high negative impacts, particularly on migratory fish. If all development plans are carried out, there could be over 150 large dams (those over 15 metres in height) built in the Mekong River and its tributaries. The extensive hydropower development in the Mekong River requires effective cooperation mechanisms between the riparian countries to ensure sustainability. The lower Mekong countries signed the Mekong agreement in 1995, which resulted in the establishment of the Mekong River Commission. However, China and Myanmar did not take part in the agreement. 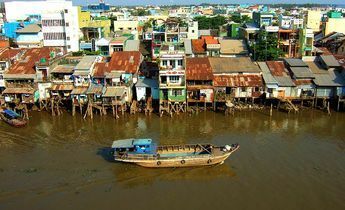 The international framework of the UN Watercourses Convention has also so far been sidelined, and only Vietnam has ratified it. In 2016, a new “Lancang-Mekong Cooperation Mechanism” was launched with China’s backing and signed by all six Mekong countries. This initiative is still in its early stages and it remains to be seen whether it will provide an effective forum for tackling the complex issues faced by its members. Existing dams in the Mekong River Basin and dams planned or under construction. Click for detail. 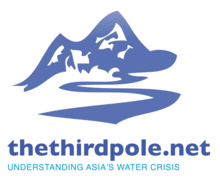 China is in an important position in terms of water resources and international rivers, as previous research from Aalto University has shown. China is the source of six major southbound rivers: Indus, Ganges-Brahmaputra, Irrawaddy, Salween, Mekong and Red River. These rivers are shared by 12 countries and the basins have a total population of over one billion people relying on these water resources. Our aim is to improve the sustainability of hydropower development in the Mekong River Basin, and is motivated by the lack of publicly available information on hydropower operations and their downstream impacts. Our findings call for active engagement and cooperation between the countries that share the same river to address the negative effects of the hydropower development: improved information sharing, research collaboration and an agreement on the maintenance of acceptable river flows are needed. To read the full study: Timo A Räsänen et al. 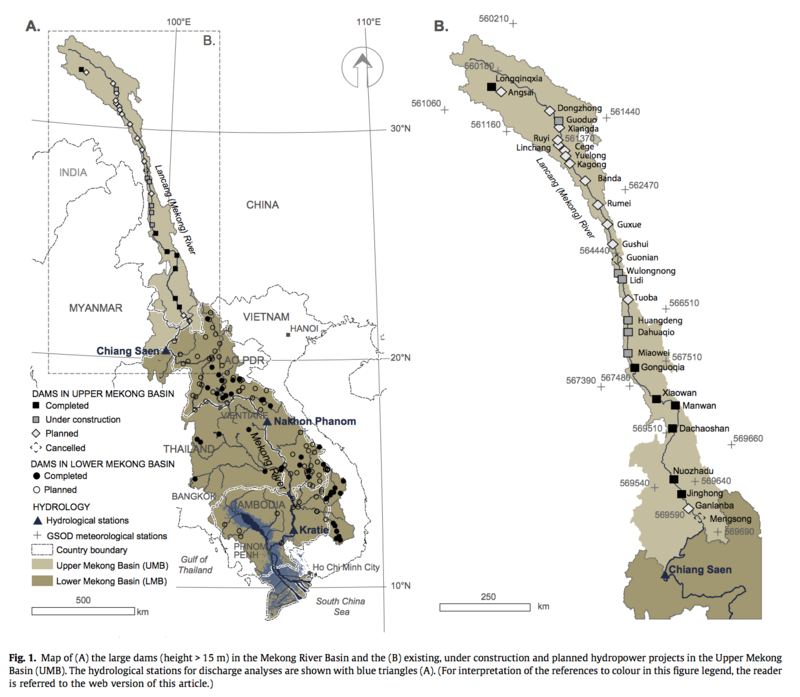 Observed river discharge changes due to hydropower operations in the Upper Mekong Basin, Journal of Hydrology (2017). This article was originally published on thethirdpole.net. Timo Räsänen is a postdoctoral researcher at the Water and Development Research Group, Aalto University, Finland.